Think that sound engineering might be the music industry job for you? Sound engineers get to be there for the all the good times - at the end of a really great show, chances are that the sound crew will be buzzing just as much as the band. But for all the good times, sound engineers also have to carry a lot of responsibility (not to mention putting up with more than a few cranky bands). Many people think of the sound engineer as the person who stands behind the big sound desk (aka mixing desk) at a show and mixes the sound the audience hears (also known as front of house (FOH) sound). Since there are four distinct steps to commercial production of a recording (including recording, editing, mixing, and mastering), there are other types of sound engineers with particular roles and specializations. Here, veteran sound man Simon Kasprowicz, aka Kas to his friends, shares some insight into the job of a sound engineer and tons of good advice for getting started. 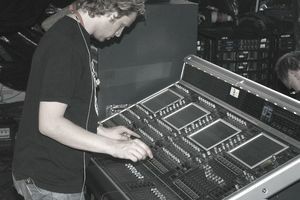 A consummate professional and top notch sound engineer, you name a type of show or size of the venue, and chances are Kas has worked it and worked it well. His words are definitely worth taking to heart. Q. First things first - what exactly is a sound engineer? A. Sound engineers come in many guises and none of these are mutually exclusive, a good sound engineer will have a balance of most of these skills. I tend to work as a live FOH (front of house) sound engineer; when you go to a concert and see the big desk and racks of gear at the back of the room I'm the guy standing behind it operating it all, mixing the front of house sound (FOH). This is what the audience hears. Every instrument on stage has a microphone pointing at it or is plugged into a DI box (direct injection box), i.e. kick drum, snare drum, hi-hat, bass, guitar, keyboard, violin, vocals. Each one of these corresponds to a channel on the mixing desk, and it is my job to balance the sound, make sure everything is audible and pleasing to the ears, via the use of gain, EQ, compression, effects and so on. There is also monitor sound, which will either be done at the FOH desk or on a separate desk at the side of the stage. This is what the band hears. Each member of the band will have a set of monitors either in the form of wedges on stage or in-ear phones, and the monitor engineer will send individual mixes to each of these as the band requires. This is not always a balanced mix like out front, as the musician may only what to hear key things. The singer may only want his vocals since he can hear the drums and guitars loud enough already. The musicians will instruct the monitor engineer to what they individually require. Then there are the system engineers. These are the guys and girls that set up the PA system, rig all the speakers, set up all the amplifiers and system processing and make sure that everything thing is working as it should be. A good system engineer makes your job as a FOH engineer much easier. Then there is the stage crew who place and cable up all the microphones and do any re-patching that may be required. On some gigs, especially smaller ones, all of the above may be done by one person. Q. What kind of training do you have? A. I started out working weekends in a small jazz club in Edinburgh (Scotland), learning on the job as I went along, then moving on to bigger venues such as King Tuts Wah Wah Hut in Glasgow and festivals, to working for the bands directly touring Europe and the States. Q. What is the pay like for your job? How do you set your prices? A. Pay varies greatly and is totally negotiable depending on the job, hours conditions, etc, but I normally get between $200 and $500 a day. Q. How do you find work? I get work mostly through word of mouth and reputation, with bands contacting me through friends, tour managers and directly, with some regular work at venues and for PA hire companies, doing bands, festivals and corporate events (conferences, award shows etc). A. What separates a good sound engineer from a bad one? What are some bad habits some sound engineers have that bands should watch out for? This is such a difficult question. Who's the best record producer? George Martin, Phil Spector, Steve Albini, Butch Vig? It's totally subjective and depends upon individual taste. What some will think is fantastic others will find fault in. Bands need to work together with their engineers and find a style that is suitable for them. A good engineer will be able to mix a variety of different styles well. I started in a jazz club, then did a load of folk festivals and worked in clubs doing funk, dance, rock, indie and metal so am well versed in many styles of music and completely adaptable to what the situation requires. The main thing is to have a good attitude, remain calm under stress and keep a smile on your face. Q. What can bands do to make life easier for their sound engineer? A. Bands can make the sound engineer’s job a lot easier just by following a few basics, especially when they are starting out. Be organized about how you set up for starters, i e if you have a lot of FX pedals, don't take 20 minutes plugging these up have then pre-set up on a board so it only takes you two seconds, the quicker you can set up the more time you'll have to sound check. Listen to the engineer. In small venues he may ask you to turn down your back line (guitar amps , bass amps etc); he's not being malicious, it could be that they are drowning everything else out. If need be, tilt your amp up towards your head or stick it on crates, you'd be amazed by the number of guitarists who think that their ears are in their knees. If you don't have them already, buy tuning pedals and tune when you are not playing, the number of sets that are ruined because the momentum is lost as the band spends five minutes between songs tuning up. Also, know what you are trying to achieve, in a sense good bands almost mix themselves. By this, I don't mean they have a mixer on stage and ride the faders, but that they've thought about their sound and levels and the songs are well arranged so that everything has a place and sits in the mix. Generally be nice, polite, punctual and friendly to the people you meet at the gig. Q. When you get to a venue, what do you want to see there waiting for you? What do you see that makes you think "uh-oh?" A. A nice hot cup of tea. Friendly efficient house engineers and good PA that has been set up correctly and is suitable for the space with good well maintained equipment. I think uh oh when the gear is clearly falling apart hasn't been looked after and in some cases blatantly not working with an in-house engineer who is passed caring. Q. What's your best advice for someone interested in becoming a sound engineer? A. Ha, get a real job. Na, work hard, try and get a foot in at some local venues, listen to a variety of different music, go to a lot of gigs and chat to the engineers there, and contact the local PA companies and see if you can help out there.